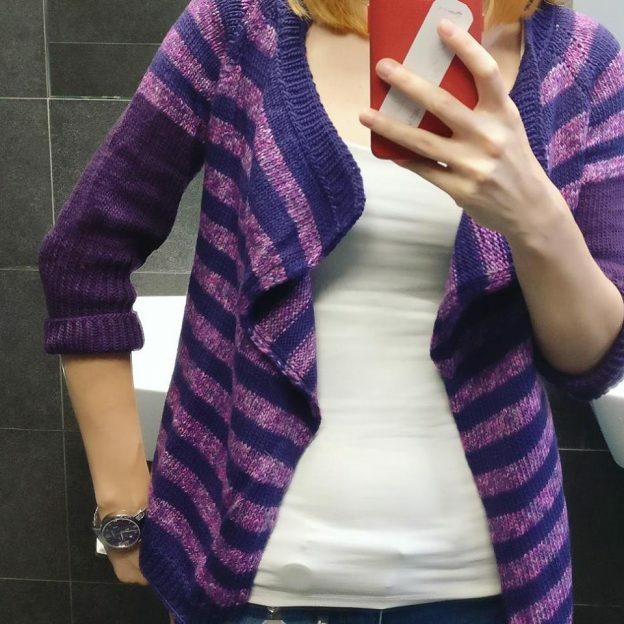 Last year, in October I started working on this knitted cardigan. I believe I’m not the only one who’s wandering through Ravelry, looking for a new pattern to work on, when the library is full of projects waiting to be cast on. Well, I was like that until I remembered I really, really liked this Caramel cardigan, by Isabell Kraemer. And so begins my Caramel journey. For this project I used Katia Merino Effect, shade 605 and Katia Merino 100%, purple (thanks to a lovely lady who sent me this yarn all the way from Frankfurt!). Used the 3,25 mm carbon needles from Knit Pro. At one point the project grew so much and I was afraid the weigh of the yarn might break these needles or the cable, but these needles are strong. Because I did not have enough yarn to finish the sleeves, I used some purple merino I had from my stash, the same thickness as Katia yarn. And made the sleeves only three quarters, I don’t want full sleeves for this cardigan, as I want to wear it when it’s warmer outside. I followed the pattern to the letter for the body part, but improvised the sleeves. I used 3 mm short circular to work the sleeves, did not cast on more stitches. Worked in the round for 41 rows then started the last 42 rows of rib – K1, P1. And cast off. Before I washed the cardigan (in the bad lit pictures below), the back was perfect, it suited me perfectly. But after washing, the merino stretched. And not where I wanted it to – length – but in the shoulders. Basically, the back was so huge, it would fall off my skinny shoulders. So I put it in the washing machine, used the wool program and washed it. After it was all dry, I took a 3,5 mm crochet hook and made a row of slip stitches on the last row of the ribbing edge, then made another row of slip stitch on the first row of the project, the first row of the ribbing edge. And this way, the back stays put, not stretching too much. You’ll see in the last picture, the one where I’m wearing the knitted cardigan, the subtle rows of slip stitches. The real color of the cardigan is the one in the „selfie”, the other pictures were made in my room, lit only by an energy saving light bulb, which does not show the true pretty color of the cardigan. How much I enjoyed the pattern? 5 starts out of 5. How much I loved the yarn? 5 starts out of 5.